Gutenberg has been controversial since its announcement, but its developers have nonetheless been hard at work getting it ready for prime time. This means you’ll want to be prepared for its arrival, including ascertaining whether your theme is Gutenberg-compatible. Fortunately, there are already lots of themes on the market that should work smoothly alongside Gutenberg when it launches. In this roundup, we’ll take a look at ten of the best options. First, let’s talk a bit more about Gutenberg itself! Every new WordPress update brings changes, but some are more transformative than others. The next major update – WordPress 5.0 – promises to shake things up in a significant way. This is almost exclusively due to Gutenberg. In a nutshell, Gutenberg is a new WordPress editor offering a stark departure from the one you’re familiar with. It’s a visual, drag-and-drop tool that provides pre-built elements you can insert into your pages and posts, customize, and rearrange at will. The goal of Gutenberg is to make the editor easier and more intuitive to use. At the same time, it does have its drawbacks. For example, existing WordPress themes and plugins have been designed to be compatible with the current editor, which means a lot of them will experience compatibility issues with Gutenberg. If you’re looking to build a new WordPress site after Gutenberg launches, you’ll need to select a theme compatible with the editor. If your existing site’s theme isn’t being updated with Gutenberg-compatibility in mind, it may be time to start looking for a replacement. Finding a new WordPress theme is easier said than done, since there are so many options available. With this in mind, we’ve compiled a list of Gutenberg-ready themes to help you get started. What follows are ten of the top themes you’ll want to check out, if you need something compatible with the new editor. Let’s start from the top! This free, multipurpose theme is designed to be versatile, so it works well for a wide variety of niches. Virtue boasts a flexible options panel that enables you to fully customize your site’s layout and design, and it’s also e-commerce ready. Provides an easy to use setup, with lots of customization choices. Built using Schema Microdata, to improve Search Engine Optimization (SEO). Offers a fully responsive and mobile-friendly structure. Pricing: Virtue is free, with an optional premium version. Much like Virtue, Weaver Xtreme is focused on providing the widest possible range of theme options. It includes more than 20 ‘subthemes’ to get you started, then lets you alter each design to suit your site’s precise needs. 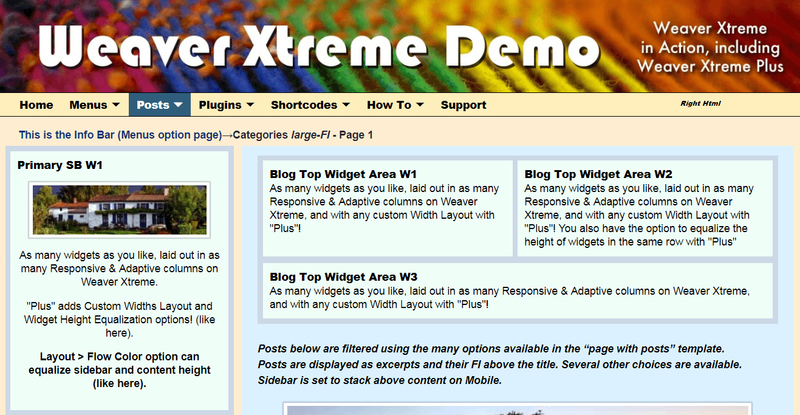 Gives you lots of options when it comes to headers, widget areas, menus, and more. Includes translation support for over 20 languages. Pricing: Weaver Xtreme is a free option, although there’s a pro version with additional features. Ascend is a clean, stylish theme that puts the spotlight on your site’s content. It’s multipurpose, but is especially well suited to e-commerce stores and portfolios. To that end, it offers a lot of options for laying out and displaying your products, along with customizable image galleries. Offers a transparent, dynamic website header. Provides various layout and menu options. Includes styles designed for blogs, portfolios, stores, and more. Pricing: You can get the Ascend theme for free, or pay an additional fee to get the pro version. When it comes to your website’s design, sometimes less is more. Ink, for example, is a minimalist theme focused on your site’s story, whether that’s based around selling a product, attracting new clients, or something else entirely. Includes custom widgets that enable you to create a tailored layout. Gives you a number of background settings for your blog posts. Pricing: A single-site license for Ink costs $55. While many of the themes on this list have simply been updated to ensure Gutenberg compatibility, Gutentype has been designed from the ground up as a theme for the new editor. Essentially, not only will it work smoothly, but it also packs in Gutenberg-specific functionality to enhance your content. Offers enhanced Gutenberg block styles. Includes theme shortcodes with Gutenberg compatibility. Provides lots of demo content to get you started (created using the new editor). Pricing: Gutentype will cost you $39 for a one-site license. If you’re using your website to run a business online, you’ll need a professional look and plenty of branding options. LeGrand is a theme offering both in spades. It’s well-designed for companies of all sizes, and along with Gutenberg, it’s also designed for compliance with the new General Data Protection Regulation (GDPR). Includes a variety of demo layouts you can customize to your specifications. Presents a huge library of customization options. Provides styles, layout options, and other functionality for your company blog. Pricing: A license for LeGrand comes in at $56. 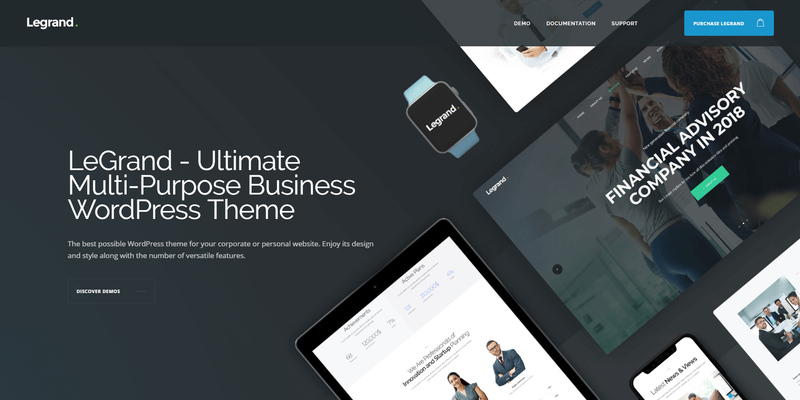 As the name suggests, Business Lounge is another theme built for company websites. It features a simple and straightforward design that puts the focus on your messaging. In addition, the generous amount of demo content makes putting together a functional site quick and easy. Includes 12 home page layouts, all of which can be fully customized. Provides various styles and layouts for headers, menus, and footers. Includes tools for building portfolio pages and lists. Pricing: $59 will get you a license and support for the Business Lounge theme. If you’re running an online store, you can’t go wrong with WooCommerce. However, this means you’ll want a theme compatible with both WooCommerce and Gutenberg. Enter Rigid – an e-commerce theme to help you build both small and complex stores alike. Compatible with both WooCommerce and other popular e-commerce plugins. Enables highly-customizable product pages with lots of image-related options. Offers a design supporting multi-vendor marketplaces. Pricing: Rigid will cost you $64 to use on one site. While there may be no such thing as a WordPress theme that does it all, Princess comes close. This multipurpose theme is well suited to blogs, e-commerce stores, business sites, and a range of other applications. The developers are also looking to add additional Gutenberg functionality in the future, such as custom content blocks. Includes plenty of demo content, including ten page templates and three header styles. Enables video and image slider options. Provides a responsive layout, mobile-friendliness, and translation-ready structure. Pricing: This is one of the more inexpensive premium options, coming in at $29. Last but not least, Opinion is a theme designed for news and magazine sites. It has a modern and clean look that’s appealing, yet gets out of the way of your site’s content. Plus, it gives you a lot of control over the way your articles are organized and displayed. Gives you the choice of many demo layout to start from. Pricing: A one-site license for Opinion goes for $69. Gutenberg is going to bring some major changes to WordPress, which can be a little intimidating. Fortunately, there are many ways you can prepare both yourself and your website. For instance, you can start looking now for a theme that plays nicely with the new editor. Many existing options have been updated to ensure compatibility. This includes broad multipurpose themes, as well as niche-specific tools. Do you have another favorite theme that’s Gutenberg-ready? Tell us about it in the comments section below! Brad Litwin is the Marketing Manager for A2 Hosting. He has been with the company since 2007. To give your site a speed boost, make sure to choose A2 Hosting for all of your Web Hosting needs. Their Turbo Servers are 20X faster compared to competing hosting solutions. What is WordPress and How Can Writers Use It?